ROSEMARY AND THE TAXI DRIVER. and Afr. B. A. Ezuma has the sole copyright for it. ROSEMARY AND THW T.4X1 DRIrR. i. The Dazzling Beauty of Rosemnry. 6. 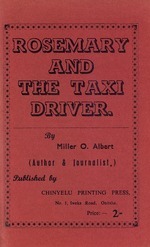 __.. ROSEMARY AND THE TAXI DRIVER. necklace, shiny ear rings a n d a botanical veil. stained all over with jet colours. wonderful ? The long carefree days had gone." journey from Lagos to the East. ests of any woman folk. ROSEMARY AND THE T.PLI DRIVER. for Rosemary to travel too. rather get lost there, than to dream of Elfland. tail of it, Yes! But I will one day, add one R "
ROSEMARY AND THi r .I DRIVER. flamboyant gestures. The frowning of her face. making airy sounds over the sky. winding, round. made many glamour of beauties shudder frantically. glamouring briskly in a stage show Yeh!". glaring at nature as super love maker.
'" I do" He replied. "What a ride, you want?" speeches. making their devilish introduction. the little idea, they've got about themselves. took Rosemary home, to cool down. to feel that he wasn't the owner of the little end. ming the car a taxi. since her stay off in the East. to go out with Rosemary for the dance. uld float down, a magpie to Onitsha. pretty tough smiles, of tremor. some part. like that of sea crocodile. make it really tough with the times. sdemeanour, but he sped over, increasing his speed. He began to eye like an imperial Corsican. any house, punching just little below the belt. lence into people, to help raise funds for them. intensively a great hit of an utterly breakdown. ing the proud delicious power, of her beauty. of Excuse me dance lady through a trivia! aith which to shun the attention of the waitress. be man who was dancing with her spoken a hiss. They mistook themselves as deaf and dumb orgies. ish dancing. She flew into the space and came. ,ack to the earth with a start, just afresh. pit fire, a tumult was caused. the waist band of his pant,with a great force, feeling. here, it is getting to down of the day!" Rosemary grimaced: "You're mad, ain't you? You are full concomitant of evil beauty and mar." ROSEMARY AND THE TAXI DRI\VR. ntic go of this beautiful world, with Okoro. " them that the man had left for Lagos the other day. gan to guess, a place to have it oIrt with the day. been committing many crimes none of the crimes. follow-him trace where he forgot his wife. of beer, from his stomach, like a parcel.of sand. down that one grieved him most. erri, that theirplots are divulged. suitable for such tough roads, as Nigerian Roads. with nature. They managed to drift near a hotel. witching demonstrator, who could undermine plots. ROSEMARY AND 1HI T. XI DRIVER. n't feel much depressed, in that her slimy self. was . ubt, she had tasted it all of a time and Isn't It ? .ith all her generate days. was the highest eccentric subtle, ever experienced. blems, in stock for the offenders. Ain't it wonderful? how could trouble remedy it. self? Someone must pay by compromise. after a mad stampede was caused. ROSEMARY AND THF TAXI DRIVER. of her beauty were rumpled into a startled look. hotel, where beauty sparks itself, amidst kindness. ROSEMARY AND THE TA\l DRI ER. to go wrong if not experts of her sort.
" The culprit conid be here Billy!" hold fast tenacious, a banner without stain ?
" Yes I can do. He replied. she is wanted, bK the young hearty man of her's.
" Excuse me Gents.! " \yhich made'the whole virlie litigants round about. accused himself of loafing with the time. It was. are at the pangs of death, or possible assailance. his head, to blow him off the skies. made way with Rosemary facing the way to Aba. just the same speed. It was a film race of li fe. Rosemary had got many senses about crime. if it wouldn't become a blessing. on some cigar blasts, didn't mind the whole affair. ppiness, like the attention of Rosemary. ROSEMARY .AND THE TAXI DRIVER. Aba, for an immediate check up.
'" Wouldn't you lie da- r,l-ing, Darling "
made me feel the waist, like a parcel of sand. " '" I shall be no but, till I reach Aba "
She replied: I'll do but not now." wind. The scaring desert winded over with tremor. had come with speed. To halt the taxi was terrible. rnered a bit, allowing cars to have way freely. him with his tanner, the driver shouted Tanner! they use their barton for an attack. Aba. Rosemary knew all of how to drive. ROSEMARY AND THE TAXI DPI'ER. minor and see if something was wrong. to go back a tug of war. ,-ba, looking for more undisturbed romance. and clear his car. This is not the end gentlemen. news went all o\er the suburbs and towns. tor but who is going to bell the cat ? and bolster into the biggest romance. they could be noticed through Okoro's tanner. "Anything can happen." Was their motto. the same wind of nature blowing. such men, doesn't always seem natural. ROSEMARY AND THB TAXI DRIVER. she was doing a sort of smuggling. is if she could be held on her way back to Lagos. bring an abominable inversion of natural Liberty. ning periods of their love. ROSEMARY AND THE TAXI DRIVE. a glamour of a beauty. The elegant beauty type. is indeed a vital gut to life. accepted the risky challenge she afforeded herself. ROSEMARY AND THP TAXi DRIVER. anybody down for the day?" The chief regret ted to have sold one last week. Okoro asked him: How! " "This is hqv I do." Your method is too childish. " on:" Let's see the receipt before I believe you." bring me that receipt. " From the beginning, Okoro had in his pocket,. slave trader was sold the slave, at sterling sixty. "Let's go en ter the car." Okoro told the chif6! found its way, journeying down the intestines. know. He'thotght that she'wasjust happy. her and ran away before Okoro's return. the limited train off to Lagos. noise of old gears without oil in its gear box. further more queries, takes hold only in Lagos. crime, are now for nothing Pity ! ROSEMARY AND THE TA\I DRIVER. Sorrowful tears of love rushed down his chin. thought of many other bad things. swampy space, before a car sank there. to the policeman. When Ok-ro couldn't see them. he reached a place where there was a spoilt road. ;o it carried away the minds of the policemen. he typanum of the ear. ROSEMARY AND THE TA\I DRI ER. began to charge prizes themselves, until they sta. to go to any officer and report. ROSEMARY AND THi TAU DRIVER. big cigar, came to Port -Harcourt, to harcourt the. wanted to lay action was against Rosemary. was Rosemary who played the game. anyhow. He replied: No: "
ROSEMARY AND THE TAXI DRIYER. he denied it and told them that his report, read a.
led him to three year jail terms. THE END.